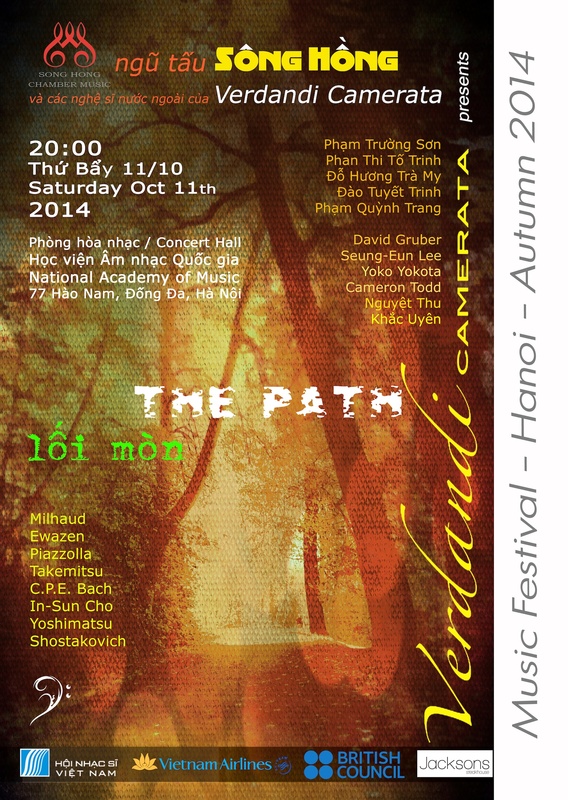 Verdandi Camerata is honoured to be invited by the Vietnamese Association of Musicians to takes part in the 1st Asia-Europe New Music Festival in Hanoi, Vietnam at the Concert Hall of the National Academy of Music. Hoang Cuong: Concerto for Oboe, Violin and string orchestra. At last, after 2 years of planning we finally have a chance to collaborate with Vietnam foremost chamber group Song Hong for an evening of chamber music packed with exciting and new works from around the globe. "The Path", small paths are chosen by choice and only chosen by a few. An exciting and thought provoking program with many beautiful surprises. Karl Lee, Lucien Engelmann, Anna Chowaniec, Klaudia Sasula, Anna Toporkiewicz, Martha Neugarten, Sacha Neugarten. 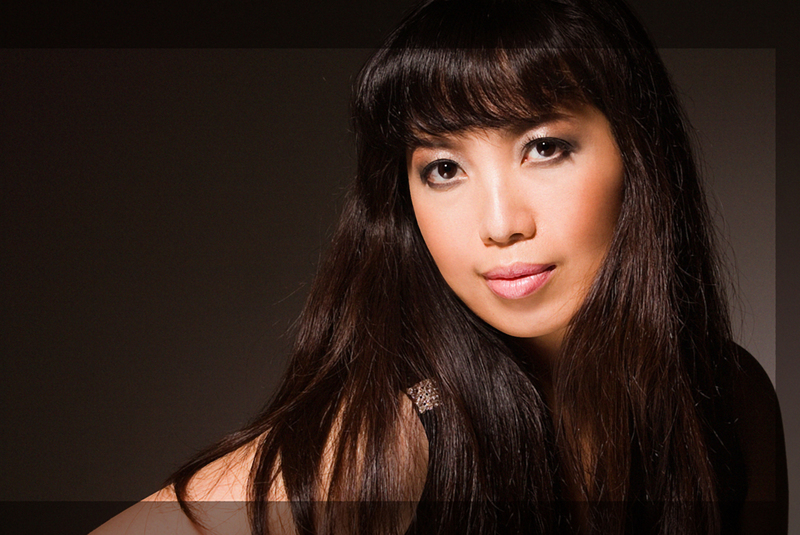 Verdandi Camerata joins force with the young Vietnamese pianist Tra Nguyen for Mendelssohn 1st Piano Concerto in G minor. We form part of the event to celebrate 40TH ANNIVERSARY OF VIETNAM - UK DIPLOMATIC RELATIONS, presents by the Vietnamese Embassy. We will also perform the *Tarantella* by Britten for his centenary, plus 2 beautiful short pieces by Elgar. The concert is being shared with the Vietnamese traditional orchestra who will start the evening. This event is by invitation only. 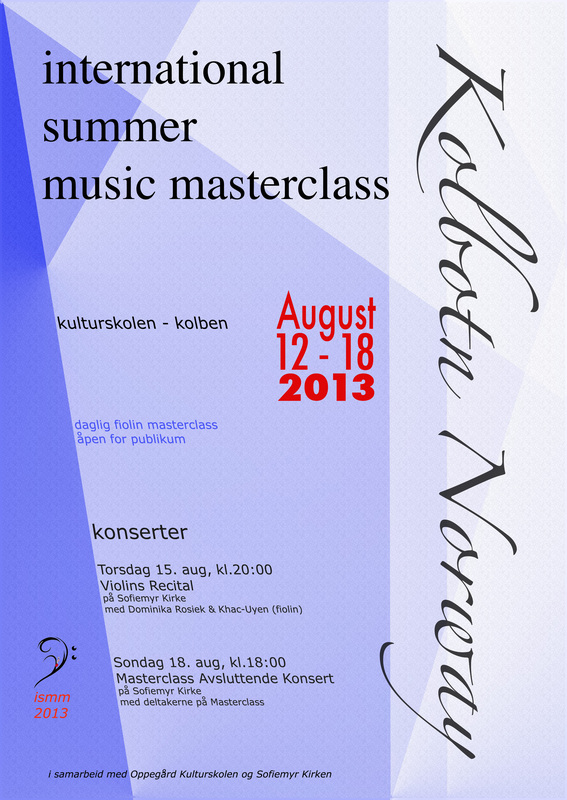 This concert is part of the first International Summer Music Masterclass in Kolbotn, Norway. Verdandi Camerata collaborates with the Oppegard district and its local organisations. 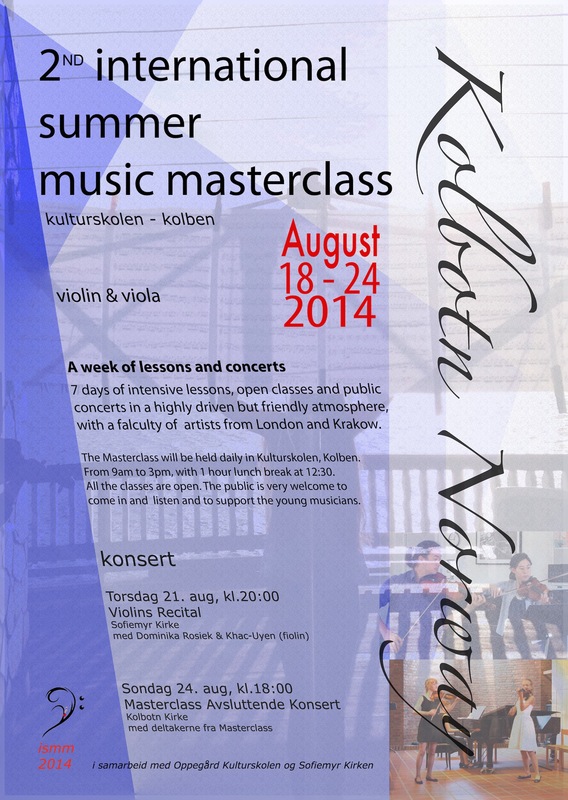 The lessons were held in the cultural senter Kolben in Kolbotn over looking the scenic lake. All the concerts were sponsored by the Sofiemyr Church. 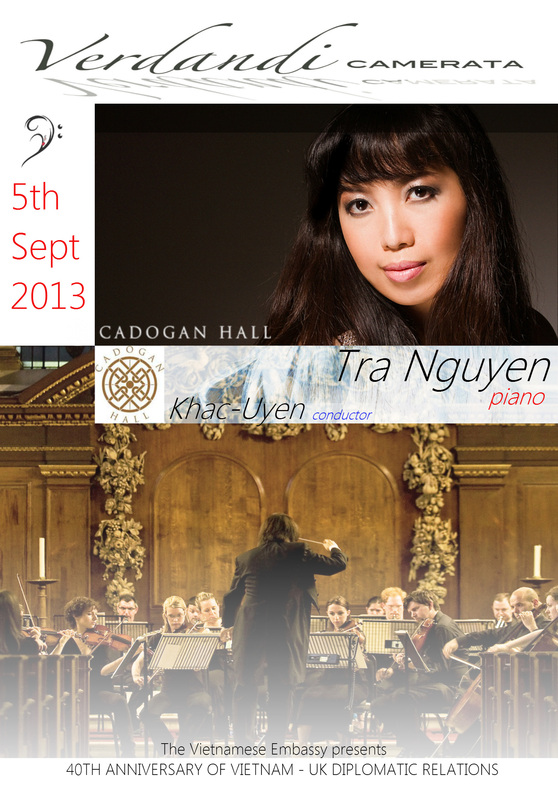 The first concert on the 15th August is a full recital share by the tutors of the course. The 2nd one on the last day of the course is the Final Concert which showcases all the masterclass students. 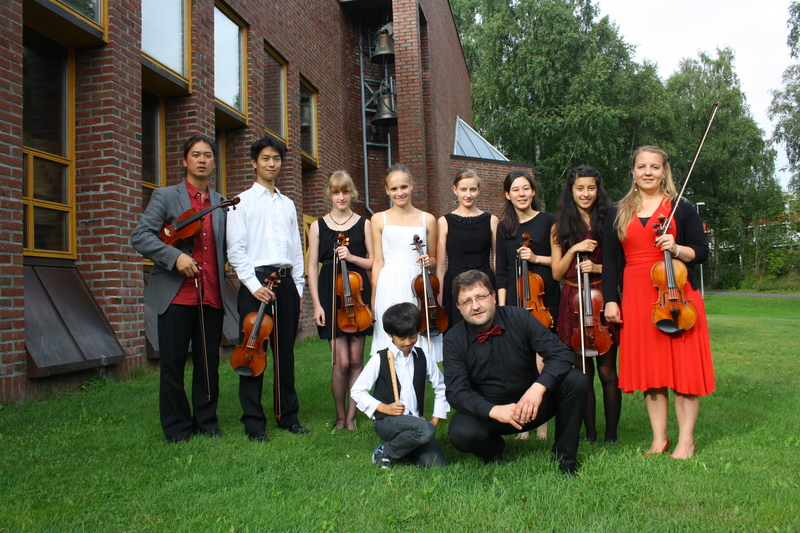 Both concerts were received with great enthusiasm and it generates a keen interest from the local public to repeat this successful project every summer. Hoonio Kim, Julia Hart, Anna Chowaniec, Alexandra Chowaniec, Anna Toporkiewicz, Martha Neugarten, Sacha Neugarten. 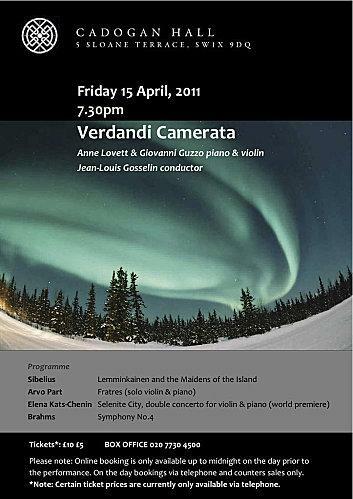 From the dark water lakes of Finland to the desolate fields of Estonia, and from the impenetrable woodlands of Germany to the imaginary crystalline architecture of Selenite City, London-based orchestra Verdandi Camerata takes you on an exciting musical journey inside some of Nature’s most secluded landscapes. 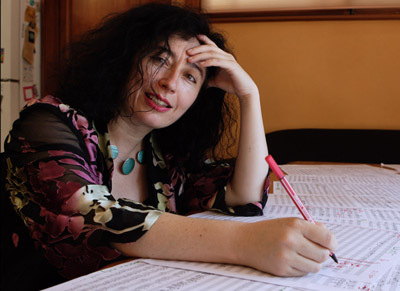 Our Cadogan Hall debut will feature acclaimed talents Anne Lovett (piano) and Giovanni Guzzo (violin) in the world premiere of Elena Kats-Chernin’s new concerto for violin and piano, Selenite City, a piece specially commissioned for this event. Ms Kats-Chernin has gained international public acclaim with her ballet Wild Swans, of which Eliza’s Aria was made popular by Lloyds TSB’s television commercials. All proceeds will go to ‘Help For Heroes’, a charity formed to help those who have been wounded in Britain's current conflicts. The concert will be conducted by Jean-Louis Gosselin. 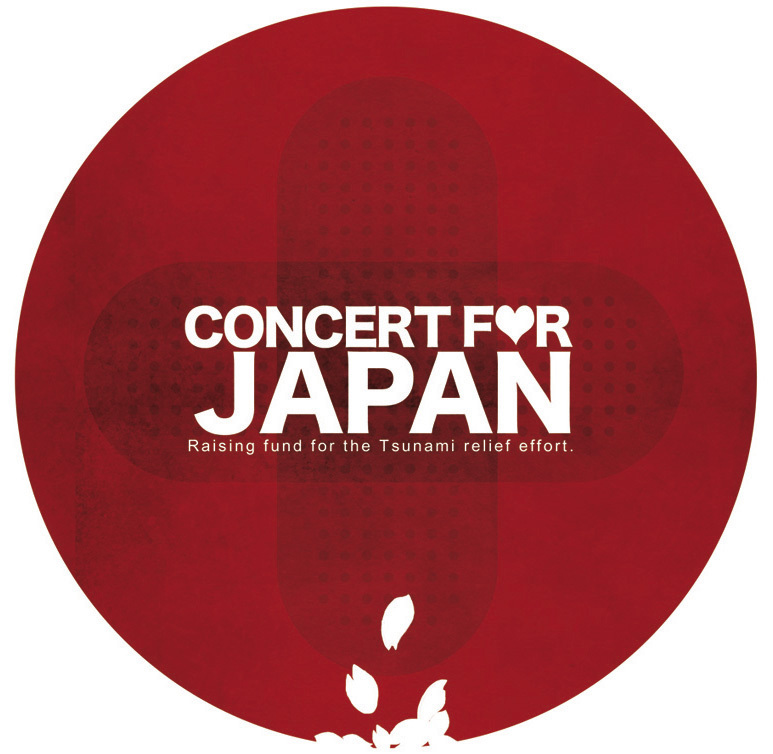 As the tragic events in Japan still unfolding, we would like to donate this concert to the Japanese people in the tsunami affected areas. All profit will go to Red Cross Japan. Verdandi Camerata's community orchestra: the Southwark Sinfonia Orchestra will be performing an exciting program with some of Grieg's most gorgeous music in the beautiful Norwegian Church in London. 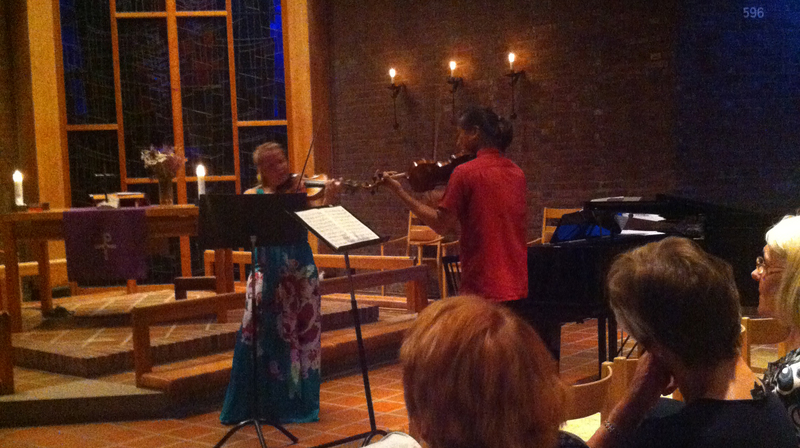 The program also includes, among others: Elgar Serenade and Vivaldi's two brilliant concertos. If you wish to make separate donation, we collect all donations to Verdandi Camerata's account. 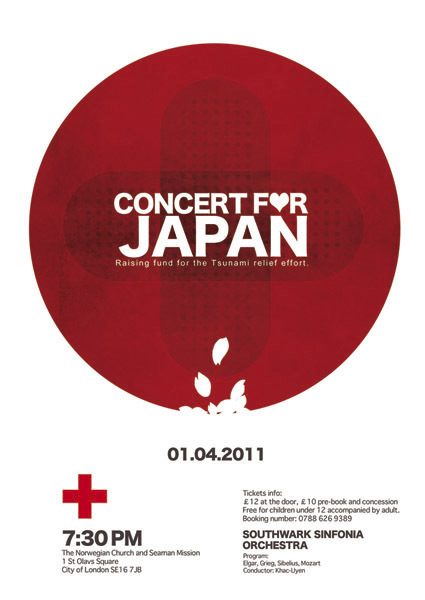 The sum will be sent to the Japanese Red Cross Society after the concert. Please put in the reference of your transaction as "Japan Donation". Cheque can also be made payable to Verdandi Camerata. The event raised vital funds for the Black Soul, a charity that supports education projects in Tanzania, including the provision of art materials that allow young people to express their God-given gifts. The ticket price includes entry, finger food, drinks and a charity donation. Leading actor Stephen Hogan (BBC’s TV series “The Tudors”, “Robespierre: Blood & Terror”) and opera singer John Savournin take to the stage in an exciting double-bill of theatre and music: Igor Stravinsky’s war-time masterpieceSoldier’s Tale coupled with the UK premiere of A Fiddler’s Tale by famous jazzman Wynton Marsalis. Performances conducted by Jean-Louis Gosselin and directed by Hugh Lee. 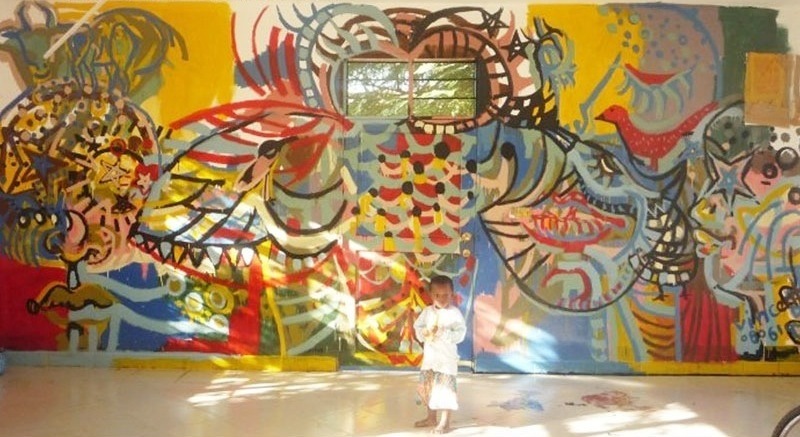 In aid of Haitian children who were affected by the worst earthquake to hit Haiti in 200 years. 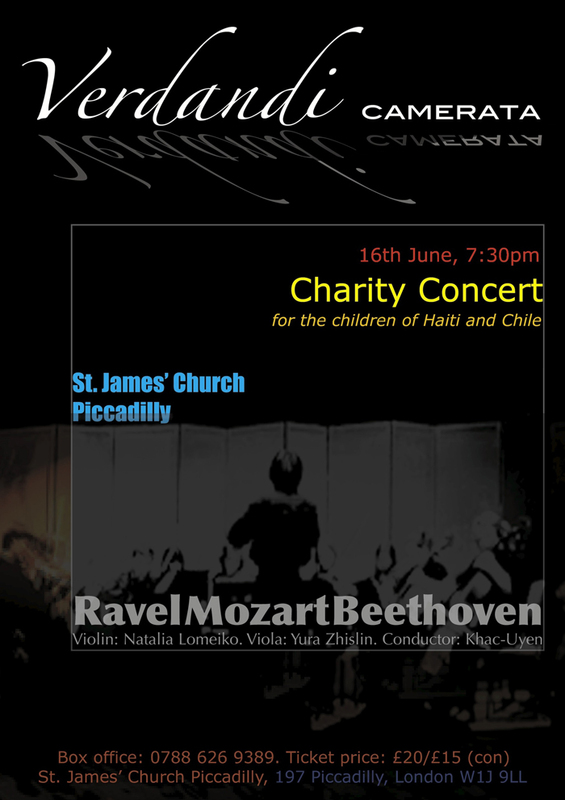 On 16th June 2010 we gave a concert fund raising for various UK charity organisations.